"This charming town lies nearly in the center of a valley approximately nine miles long, known as the Vale of Konnahecta. This was the Cherokee name for the Valley River, very near which Andrews is situated. Lumbering and tanning are the chief industries of Andrews, and, as it is the trading center of a large and prosperous section considerable business is done here. From the postoffice here residents of the country as far east as Aquone on the Nantahala River, in Macon County, are served daily with mail over a rural route. The scenery in the surrounding country is inspiring. To the north of the town Toanna Bald rises majestically to a height of 4,708 feet, and to the South Weatherman’s Bald towers to a height of more than 4,600 feet. Within easy driving distance is Mt. Tuni, the highest of the Pusquitta Balds, which rears into the clouds 5,291 feet. Outside of the valley in which Andrews is located the surrounding country is wild and rugged and sublimely beautiful." 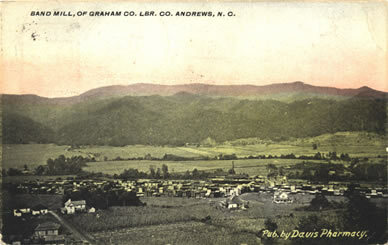 Band Mill of the Graham County Lumber Company, Andrews, N.C.
"From this point the altitude of the Railway increases rapidly, the rise being nine hundred feet within a distance of nine miles. Swinging across the Valley River again, a short distance from Andrews, the Railway two miles and a half from the bridge plunges directly under a mountain through the Valley River Tunnel, 104.1 miles from Asheville and 19 miles from Murphy. The tunnel is 346 feet long and is a remarkable piece of railroad engineering . One mile beyond the tunnel is Rhodo, a small way station, noteworthy in no special particular. The next station is Topton, N.C."
“The Graham County Lumber Co., Col. Frank Buell, president, has purchased about 30 acres of land, adjoining the property of the North Carolina Tanning Extract Co., and will erect thereon a large wood working plant, which will use over ten million feet of lumber annually, mostly low grade chestnut oak and other hardwoods. 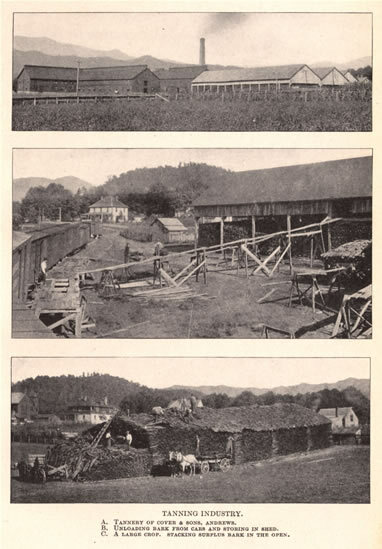 “In this immense plant which will be equipped with up-to-date machinery, the lumber will be kiln dried, and then cut up into table tops and other furniture demension [sic] stock, also made into house trim, and a specialty will be made of “cores,” that is the small pieces will be glued together and made ready to be veneered onto later by furniture manufacturers. “All the chestnut shavings trips and saw dust will be saved and the tannic acid extracted later, so that nothing will be wasted.“The entire machinery will be driven by electric motors, driven from large generators operated by steam made from the waste from the wood working machines. 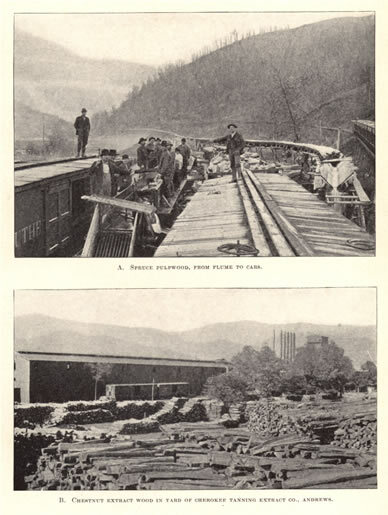 Holmes’ Forest Conditions in Western North Carolina (1911) also contained a two-part image of “Pulpwood and Tanning Extract Industries,” which showed (A) “Spruce pulpwood, from flume to cars,” and (B) “Chestnut extract wood in yard of Cherokee Tanning Extract Co., Andrews.” The first image, “Spruce pulpwood,” is not specifically credited as being in Andrews. Holmes, J.S. (John Simcox). Forest Conditions in Western North Carolina. In cooperation with the Forest Service, United States department of Agriculture, Henry S. Graves, forester. Raleigh: Edwards and Broughton Printing Company, 1911.